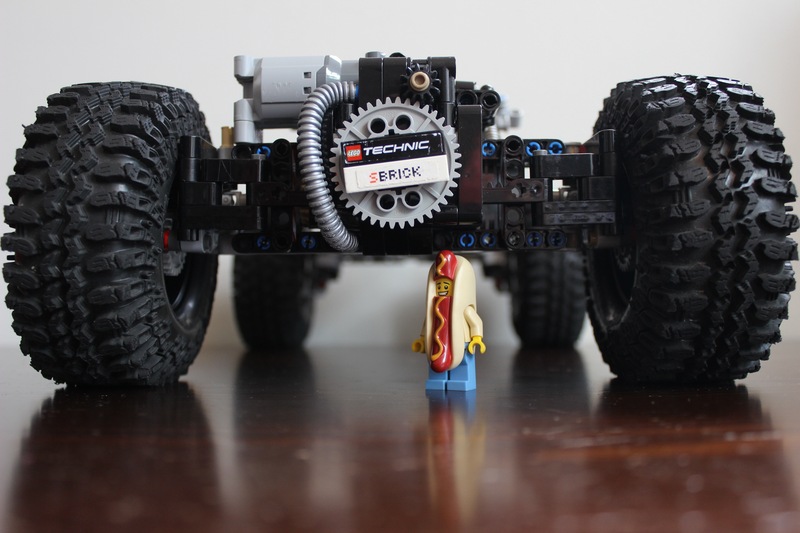 I present to you my Lego Technic Chilli Crawler! Yes, I know. This is the second crawler that I named after a vegetable; expect more! - Triangulated 4-link live axle suspension using 4 soft, black shocks. 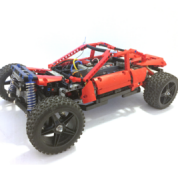 - 4x4 with one PF XL motor mounted parallel* to each of the two axles. A final gear ratio of 1:5.001, yes this may seem slow, but the enormous Super Swamper tires make up for it. - Speaking of that, 4 RC4WD Super Swamper tires. No, they are not Lego, I got them from a nearby hobby shop. - One L-motor for steering in the front axle, geared down via worm gear to 8 tooth gear, then a 12 tooth gear to a 40 tooth gear. The 40 tooth gear drives another 12 tooth gear that moves a 13L gear rack. - Portal hubs for all four wheels. Standard Lego Unimog for the rear axle for rigidity; custom triangular plate portal hubs on front axle for a steering pivot point closer to the center of the tire. - Good articulation, about ~55-60 degrees. - Controlled with an SBrick. 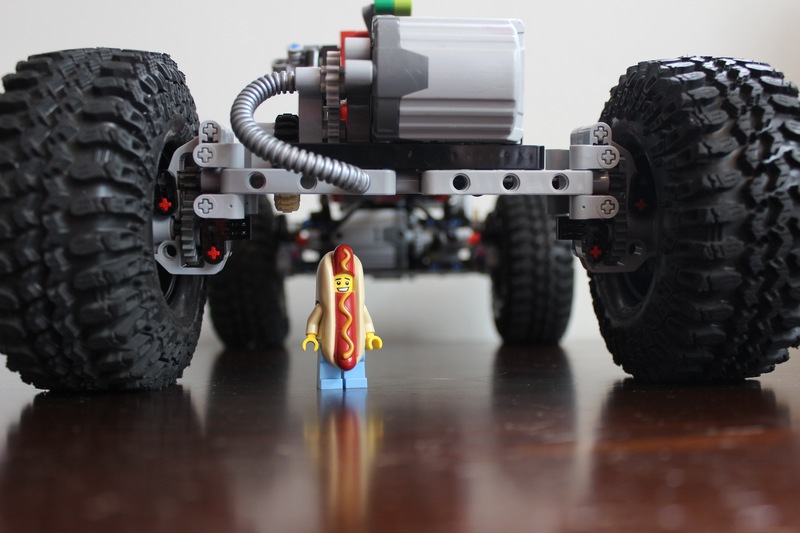 - Powered by a Lego rechargeable LiPo battery. 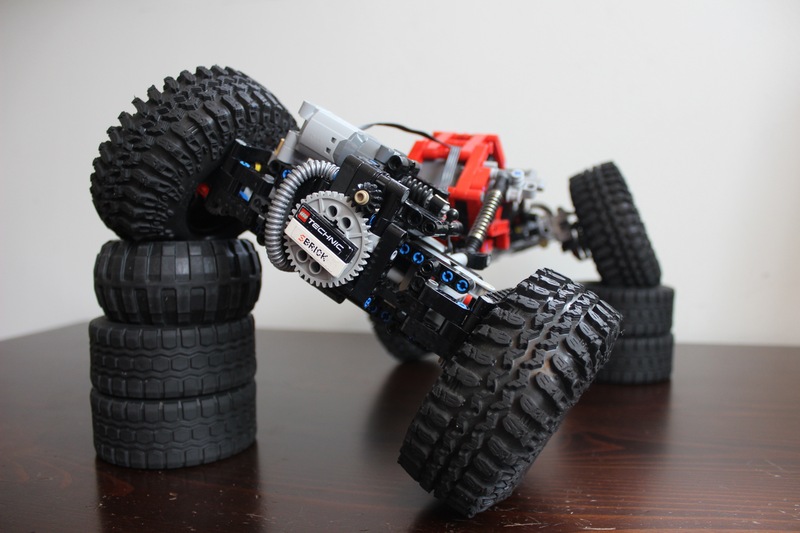 * The mounting of the drive motors parallel to the axles was a must for this crawler. By doing so, I have not only eliminated gear slippage as there are no perpendicular gears, but there is also a ton more ground clearance in both the front and rear axle. The rear axle especially as the motor is actually on TOP of the axle. Crazy, huh? ** Makes the crawler look so much cooler. - As with all 4-link suspension setups, the mounting and placement of both the links and the shock absorbers proved to be a rather annoying, tedious part of the process. I have, however, managed to make a VERY rigid triangulated setup where the shocks are not bent or warped in any way. - The mounting of the two lower links on the front axle was also difficult as there was virtually nowhere I could mount these links onto. I was able to (somehow) securely mount both the lower links and the shocks of the front axle onto 7L and 9L beams on either side of the motor. - Mounting the motors parallel to the axles proved to be hard, but actually somewhat straightforward when it came to the rear axle. 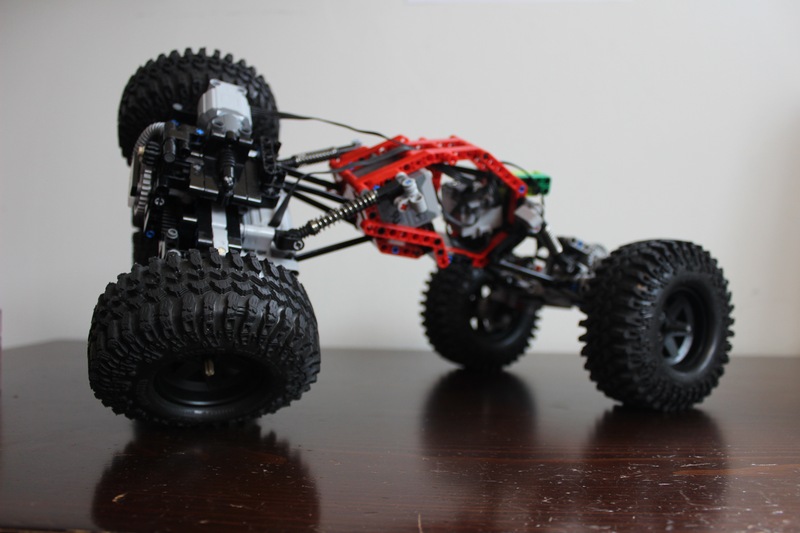 I had been so used to having drive axles perpendicular to the axle like on my previous crawler. 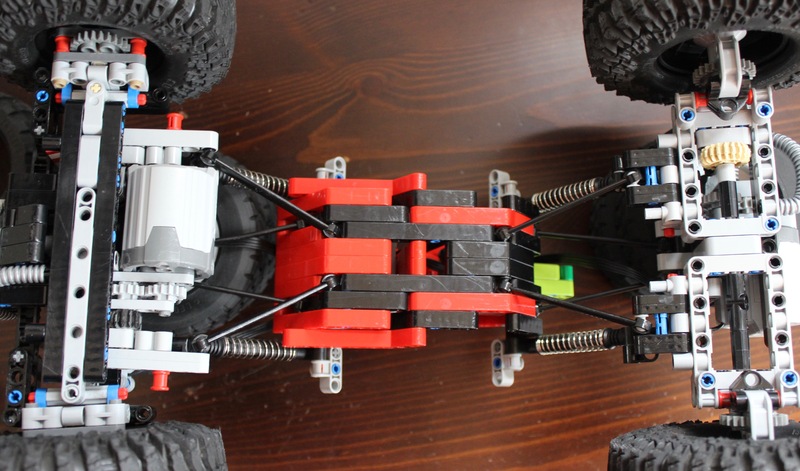 The mounting of the front drive motor was difficult in the fact that its power is transmitted through various gears and the motor itself is connected to the axle by two plate beams and a pin or two. Although the front drive motor is still not completely rigid, I have had no problems with gear slippage whatsoever in either axle. I welcome any suggestions or comments you may have. 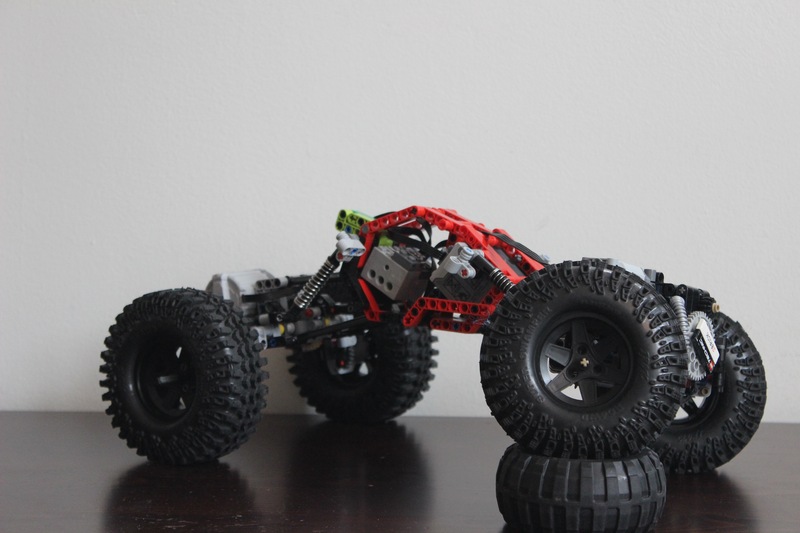 I will, however, say in advance that I DO NOT plan on making a body for this crawler as I designed it for performance purposes mostly, a Lego "comp-crawler" as you may call it. I love this! The 4Link suspension is done very well and the way you mounted the motors. Very impressive! And video is amazing! Wow, performance of that thing is a beast! Very impressive and I love the non-lego tires on it. Thanks, and I too love my blocks! This is a beast in the performance department. The ground clearance is huge, it climbs a curb without trouble. Excellent work! Amazing performance It just destroys rocks and terrain, impressive thing, excellent job! The performance seems to rival that of an actual rc crawler, great work. You might be able to get even more articulation if you make the connecting linkages longer. Thanks guys, the responses are great. 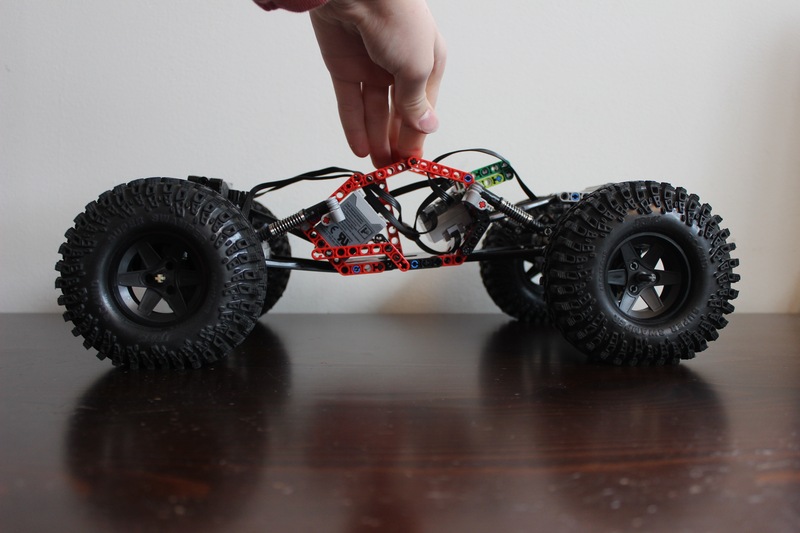 The performance seems to rival that of an actual rc crawler, great work. That's exactly what I was hoping for. Performance is out of this world, great articulation, very light and agile, good work! Love the minimalist design. Performance is superb. Thanks for all of the comments guys, they are really great. I was thinking of making an lxf file of either the front axle, the rear axle, or the whole truck. One of the best crawlers I ever saw, hands down! Wish Lego would relase some super soft tires and maybe a new motor which has two inline axleholes. That would make building such axles much easier. Superb performance as well, job done. Wondering how this will work with the new tires from the 42054 Claas??? This is a real winner of a design, LDD or BI would be greatly appreciated. Thanks so much, I do plan on making a lxf (ldd) of it soon, but not sure how long it will take. I'll post here when it's ready. Also, I was thinking the exact thing about the new tractor wheels. They look great and possibly even bigger than the Unimog tires. Something tells me, however, that they will be very stiff, which may not be ideal. Triangulated 4-links are the way to go for extreme articulation. Thanks, that means a lot. I totally agree, a motor like you said with two axle holes on either side would be SO useful. Very similar to the servo motor. It could even be like an extremely geared-down and more efficient buggy motor. Thanks so much, I do plan on making a lxf (ldd) of it soon, but not sure how long it will take. I'll post here when it's ready. Thank you for this amazing crawler - it has certainly helped to raise the already-high bar. Are you still planning on making the .lxf? 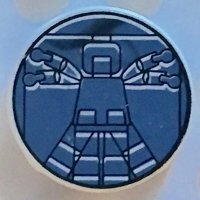 I fully appreciate the effort that it would take, but also would very grateful; I am brand new to Technic, particularly drawn to crawlers and have found the opportunity to learn from the excellent work of others - thanks to their generosity of spirit - invaluable. I am hoping to finish my first ever build today, which is JJ2's 4x4 Super Crawler. Thanks again for pushing the envelope. 4-link live axle is awesome!!! Your tire has ID 1.9in or 2.2in?